Play with ease. Prevent injury. Enjoy the music! This is what many guitarists at any level experience - headaches, disappointment and frustration. But guitar playing shouldn't be that way - it should be fun, effortless and enjoyable! You might think nothing can combat nerves, frozen muscles and sweating hands, but I can assure you that there is a solution. One of the most important solutions is to systematically practice the difficult aspects of guitar playing. This is something that many books and videos on guitar playing don’t address in detail. Once you start practicing these things on a daily basis, then your resilience to nerves will improve. Your playing will no longer be hindered by technique, but will be on fire. Your musical voice will shine out strong, inspiring and moving your audience to that special realm where music can take us. One of the greatest fears a guitarist can have is the threat of injury. Injuries can be prevented by establishing a warm up routine of basic exercises that promote healthy habits, which result in efficient and controlled playing. Practicing in this mindset before you play pieces is a crucial key for avoiding injuries. Many guitarists do not have such a routine of simple exercises and will often dive straight into difficult pieces or challenging exercises. Do you have a healthy and balanced warm up routine? The exercises in this course were mostly created by me. I have never suffered any injuries (even minor ones) throughout my entire career. This is because I always prioritize warming up with simple exercises and encourage healthy habits to persist while practicing advanced pieces. You might be amazed at how very simple exercises like practicing open strings, can benefit when you play advanced pieces. In fact, the great cellist Pablo Casals practiced open strings for hours a day and he had a very long and fulfilling career! Even if you don’t take this online course, please consider practicing open strings each day before you start playing pieces. 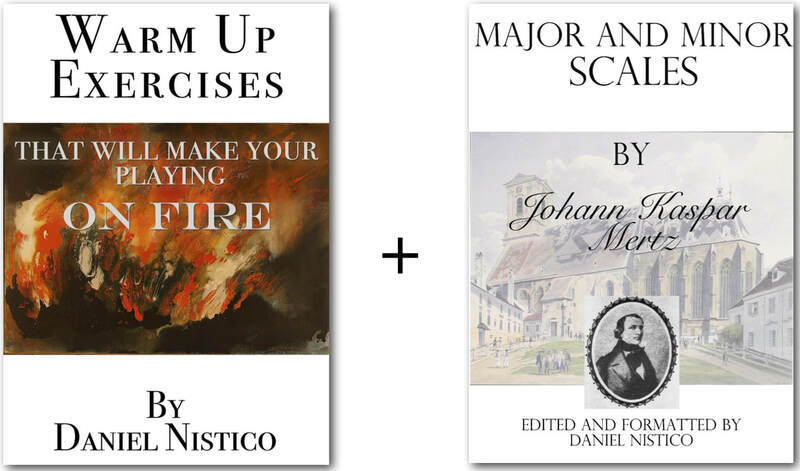 "Daniel Nistico’s online Warm-Up Course is exactly what I have been looking for! The materials are creatively and thoughtfully designed. The accompanying online videos have helped me to incorporate technical and musical elements into a warm-up routine that have already made a difference in my playing. Daniel is a gifted and generous teacher and I cannot imagine any guitarist at any level of development not benefiting from this outstanding course." As a performer, I know how crucial it is to be fully warmed up before a concert or performance. My best performances were always preceded by amazing warm ups. I want to share these exercises with you, so that you can give performances you're proud of - performances where your playing is on fire! This online course systematically guides you through the exact warm up exercises I've found to be most effective. I use these almost every day and have shared them with other students - these exercises will help you unlock the untapped potential of your technique and musicality. The ultimate result is effortless music making, taking away the worry and interference of technique! Daniel is a passionate performer, teacher and author, who also specializes in the performance practice of 19th century guitar music. He has given performances in China, Serbia, the Czech Republic, Chile, Australia, the USA, and New Zealand. Daniel has published numerous books on guitar playing and has an online studio of 25 students from around the world. Through his precise and detailed teaching, he has helped guitarists who were suffering from focal dystonia. Daniel received his Doctor of Musical Arts from the Eastman School of Music and was the first guitarist in the history of the school to be nominated for the prestigious Artist Certificate award. He won first place in the Lions Global Youth Music Competition and second place in the online, multi-instrumental World Competition. - Make scales enjoyable and relevant with this practice method! - A downloadable booklet is provided for each topic. - Every single exercise is provided with a HD video demonstration! Take this course at your own pace, in the comfort of your own home (or any space you choose). Just make the one payment and you'll have unlimited access to the course. "Daniel's continually helped me to be a more musical musician on and off the guitar. His aptitude for analysing a players technique and prescribing the appropriate repertoire that caters to the wants of the individual whilst developing them is rare indeed." "Daniel was the first teacher I had that showed me how to become a true musician. His manner of teaching was clear, concise, and natural. This ease of communicating bridged the gap between theoretical concepts and the guitar, therefore allowing me not only to understand the concepts on a deeper level, but utilize them to create richer music." You can either keep letting technique interfere with your music making, or take this course and free the fiery musical voice within you. If you go through the materials and don't see any results, then I'll happily give you your money back.